It is my great pleasure to present the Musikal Journey and Q&A featuring Jeffrey Steitz, co-founder of the highly successful brand and social venture Serengetee. Jeff also happens to be my younger brother, who I enjoyed many happy hours with at the piano throughout our childhood either playing together or listening to his singing, sparkly (oh-so-beautiful) tone during daily practice. We actually used to fight over getting to practice so much so that our mother purchased another piano to put on the other side of the house (how lucky were we?!). Although he has turned his professional interests to areas outside of the piano, music continues to play an important role in his life. Jeff is also grateful for how childhood music lessons have made him more detail-oriented and better able to focus on tasks. We chose to feature Jeff today because, as we all know, very few music students end up becoming professional musicians down the road. So parents and children alike might wonder, are music lessons really worth the financial, time and emotional investment? Our answer is yes! Read below why Jeff thinks so too! Job/Instrument? Founder of Serengetee, a charitable brand that incorporates global fabrics into clothing products. I also play piano. Above, Jeff & Samantha Steitz. I started playing piano when I was four years old. I don't remember much from that time, but I do recall working hard on the early Suzuki books so I could earn stickers from my teacher, Marina! Later on, I went to piano summer camp in Vermont, where I learned the value of dedicated and focused practice. 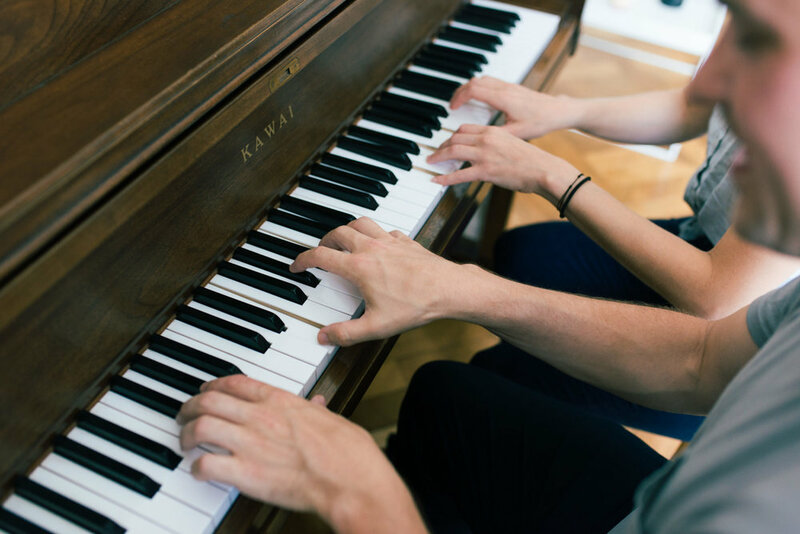 Having grown up in a musical family, how did playing music at home (practicing piano, playing recordings) and going to concerts shape your household? Music was always around me growing up, whether it was my sister practicing, a Scarlatti recording, or an opera at The Met. This allowed me to become very comfortable with classical music almost through osmosis. I think this musical background was a calming force throughout my childhood. What role did your childhood teacher, Marina Obukovsky, have in your early years? Can you recall any funny anecdotes from lessons? Ms. Marina, as I always called her, was certainly a hugely positive role model for me growing up. In a way, I think the fact that we were both perfectionists really helped from a musical and personal standpoint, as we spent hours and hours tweaking minor passages and working endlessly on sound. Of course, I remember playing games like Musopoly and doing hand strengthening exercises. That said, I know I put her through a lot throughout the years - sorry Ms. Marina! Have you been able to transfer skills acquired through dedicated practicing and recital preparation into your role as CEO of Serengetee and other current business pursuits? I would say that my music education taught me to be extremely focused and attentive to details, skillsets that I use every day. It's also important to add that piano playing is still a major part of my life and works as a kind of outlet for any stress and anxiety. What are your top three must-haves while on the road? Bose noise-cancelling headphones - planes are loud!!! What do you know now that you wish you had known during your first years of entrepreneurship? Well, I basically knew nothing when we started out, so this list is endless. I certainly wish I had known that it was okay to ask others for help and guidance as this is always the best first step before diving into any new project. Your TedTalk at TedxFoggyBottom is about how you found a way make a living by combining your two passions, traveling and service. What advice would you give to college graduates who aren't sure of their next steps, or even what their passions may be? My main message is to simply try and put your ideal lifestyle first and find work that allows you to pursue this lifestyle. If you're creative about it, this is actually not an impossible task! One trick for figuring out what you want to be doing is to ask yourself what you'd be doing if you had no restraints whatsoever or what the 12 year old version of you would be doing. What factors are important for musical success? I would say that musical success is probably defined differently for everyone. For my piano playing, I enjoy closing my eyes and listening intensely to the sound.